Watching the news lately can be very saddening and reading horror true stories circulating the social media channels triggers the scaredy cat in me. But what even got me more worried is that bad elements would go on a limb just to harm others. They would dress decently, some even good looking and project a friendly harmless aura. The pranny goose (paranoid) in me is very evident whenever we’re out with Gabbie. I may look calm and collected but deep inside thoughts and scenarios come playing in my head and by then I’ve studied the area and scanned for suspicious looking elements. So I read today the blog posts from Kris, Keeping Your Kids Safe in Public | OC Mom in Manila and Rone, Mothering Earthlings: Lessons In Safety. Their posts got me thinking and actually inspired me to a make a post of my own about G’s safety outside our home. I am just glad that we’ve somewhat trained Gabbie to be shy to strangers. And when I say shy I mean she’s uncomfortable, uneasy and tend to cry out loud if she’s forced to say Hello or even to smile to someone she doesn’t know. I am all for kids who are bibo (witty) when it comes to people, who warm up easily to strangers because these kind of kids are the ones I’d definitely invite to G’s birthday parties and would volunteer them for the kiddie games because they’re fuzz free and well just adorable. It has never been a big deal for my husband and I that Gabbie takes a while to be warm and friendly to others. Her doctors actually told us that Gabbie is like a car. She needs to get warmed up before she can get to race her way on the road (a little revving up is needed). Like she treats everything new as a threat first and waits for our go signal if everything is safe for her to freely navigate and be comfortable. While some parents would encourage their kids to be as witty as other kids are (which I think is natural), we don’t. We’re fine with the fact that our daughter isn’t that comfortable nor open (yet) to the idea of running for Little Miss Congeniality. Anyway, here are some tips I’d like to share with you all based on my experience with Gabbie. 1. ALWAYS BE ALIVE, ALERT, AWAKE WHENEVER YOU’RE OUT WITH YOUR KIDS. Be it in an unfamiliar or familiar place for you and your kids, remember to always be alert. It helps to be paranoid at times, the adrenaline rush you get from it makes you more alert of your surroundings. I’ve actually encountered strangers coming up to me and Gabbie complementing how cute she is. Being a nice person that I am I just smile and say thank you. There was one time that a lady was trying to engage in a conversation and even tried touching Gabbie which really got me paranoid and uneasy. You know some can even hypnotize you into believing they’re nice and all. I suddenly remembered just that and immediately walked away. 2. BRIEF YOUR HELPER & KIDS EVERYTIME YOU GO OUT. You may sound like a sirang plaka (broken record) but a little reminder every time you go out can help your family bonding less stressful. If you plan on going to a mall that’s on sale expect heavy traffic of people and brief your yaya & kids on what to expect. Instruct your yaya just incase she gets separated with your kid to immediately call you on your mobile phone and assign a meeting place where you could pick them up. Also prepare a calling card with your contact information such as your name, mobile number and address and put it in your yaya’s & kids’ pockets just in case unavoidable scenarios happen and you get separated from each other. 3. DON’T RELY ON YOUR YAYA ALONE. While it is tempting to leave Gabbie and her yaya (technically our helper) alone so that I could pamper and enjoy some me time for myself I’ve actually never done that EVER. There’s nothing wrong about doing so and I know most moms do that but because I’m paranoid just like that it has been a silent rule for my husband and I to never leave our daughter alone with her yaya. Usually a member of the family stays with them should my hubby and I plan to spend time together. If it’s not possible to have a member of the family stay with your kids while you’re out, call one of them instead to let them know that your kid is alone with his/her yaya or if you’re living in a condominium advise the security personnel on duty about the situation. Let your yaya know that you’re keeping a close eye on her and your kid even if you’re out of the house and cannot physically be with them. Other parents I know would install CCTV cameras inside their house just so they could get a good look on what’s happening to their kids. Maybe someday I might just to that, we’ll see. Although Gabbie is still young enough to understand the concept of “strangers” my husband and I try to let her explore on her own but at the same time tell her a story of how she can get an “ouchie” while walking too far from us. 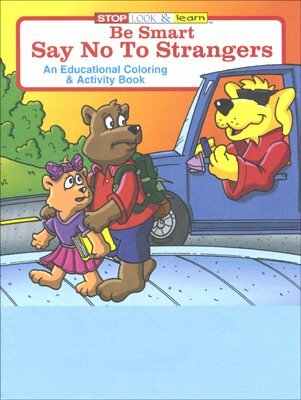 I am now in search for a book that would best help me teach Gabbie on how to be smart and on how to deal with strangers and found this online. we all need to be vigilant. this is a great reminder to all of us. Thanks for sharing this. Yes, we have to be very vigilant in our surroundings especially for the safety of our little ones.